An internally displaced mother and her children among IDPs in South Sudan. The United Nations World Food Programme announced today that it will scale up its assistance to reach 80,000 people affected by the recent escalation of ethnic violence in South Sudan’s Jonglei state. “The violence in Jonglei is only one of the many challenges that South Sudan is currently facing, and the world must respond to ensure that the people of this new nation have the support they need to build a peaceful and prosperous country,” said Deputy Executive Director for the World Food Programme (WFP), Ramiro Lopes da Silva, on a visit to the region. Deadly clashes between the Lou Nuer and Murle communities in recent weeks have displaced tens of thousands of civilians and prompted UN agencies to launch a major humanitarian operation to assist those in need. Part of WFP’s response includes providing a 15-day emergency food ration to displaced persons who have been affected by the attacks, as well as using its logistics expertise to help other humanitarian agencies overcome challenges to establish a way for people to access their services. According to a news release issued by the agency, WFP has already deployed three helicopters, an airplane and 28 trucks to deliver not just food but also shelter items and medical supplies to remote corners of Jonglei. WFP stated that one of its priorities is distributing food before the rain starts in March as 90 per cent of locations targeted for assistance will become inaccessible by road. It also emphasized the need to help affected households cultivate their own crops in time for the next harvest in August. Ten locations in Jonglei have already been reached by WFP. Five of these are located in Pibor county, including Pibor town and surrounding villages, Lekuangole, Gumruk, Labrab and Boma. Five more are located in recently affected areas in the northern parts of the state. Initial emergency food assistance has been provided in Duk Padiet, while distributions are ongoing in Akobo and Walgak, Yuai in Urur county and Waat in Nyirol county. 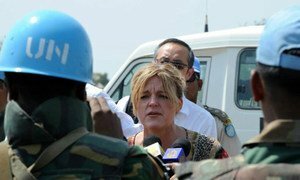 The top United Nations envoy in South Sudan stressed today that the best way to protect civilians in the strife-torn state of Jonglei is through military deterrence and urged the Government to deploy more troops and police in the area to patrol buffer zones between rival communities and defuse tensions.